An increased demand for skilled workers in the fields of information technology, STEM, education, and healthcare in Iowa translates to promising job opportunities for students who complete vocational and trade education. Students interested in the fields of agriculture and manufacturing can look forward to steady employment opportunities in Iowa as well. This guide provides information on vocational and trade schools in Iowa, the career paths and opportunities available to graduates, and resources for students interested in enrolling in a vocational program in the state. Popular vocational and trade industries in Iowa include personal healthcare, manufacturing and transportation. In fact, the U. S. Bureau of Labor Statistics expects that job growth in the transportation industry alone will see a 19 percent increase in available job openings. Factoring in metrics like cost, available financial aid and breadth of programs, we've ranked the following schools to help give prospective students in Iowa a great place to start their searches. 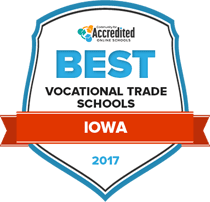 As a first step to choosing the right Iowa school, students who are interested in these fields can start with our ranking of the top accredited vocational and trade schools in the state for 2016-2017. Since 1966, students at Western Iowa Tech Community College have pursued career and vocational training to establish job credentials by earning undergraduate certificates. Accredited certification programs are available in accounting, administrative office support, auto collision repair, human resources, construction, culinary arts, dental assisting, early childhood education, fire science, HVAC, help-desk support, home care assisting, emergency medical technology, pharmacy technology, video game design, production welding, and electro mechanical specialist (wind energy). Western provides students opportunities for scholarships from the Western Iowa Technical Board and Gap Tuition Assistance in pursuing a certificate, credentials, endorsements, and in preparing for professional exam/licensure. The Eastern Iowa Community College District directs more than 50 career credit educational programs taught by instructors with professional experience in their field. Campus career credit programs are offered at Clinton Community College, Muscatine Community College, and Scott Community College. Diploma and certificate programs represent the fields of agriculture, architecture/construction, business management, information technology, hospitality and culinary, finance, public administration, health science and human services, law enforcement and security, manufacturing, technology and engineering, marketing, and transportation services. In addition to career credentialing programs, the district sponsors non-credit, continuing education programs for students seeking individual course training to update professional/technical skills. For students pursuing undergraduate career preparation, there are more than 153 programs and short-term certificates available at Des Moines Area Community College. The Urban Campus of Des Moines Area Community College has served career students from all over Iowa and from more than 75 countries. Its certificate-granting programs include curriculum in accounting, agribusiness, animation, biotechnology/agronomy, computing languages/databases, digital marketing, early childhood education, farm management, fashion design/merchandising, fire protection science, homeland security, human resource management, and informatics. Allied health programs lead to certificates in long-term care, phlebotomy, respiratory therapy, and dental assisting. DMACC maintains partnerships with tool and die firms, farm equipment manufacturing, and the Department of Labor (apprenticeships). Indian Hills Community College, founded in 1966, is one of 15 community colleges in the state of Iowa. Its divisions of Advanced Technologies and Health Sciences provide a range of certification, continuing education, and re-licensure curriculum. The Advanced Technology division combines classroom instruction with hands-on learning based on workforce requirements. Diploma and certificate programs range from 6 to 12 months in duration. Programs include commercial truck driving, avionics electronics technology, construction trades, grounds equipment technology, HVAC and refrigeration. Students can also pursue certifications in emergency medical technology, dental assisting, practical nursing and phlebotomy. Hawkeye Community College has developed a comprehensive, accredited curriculum leading to certifications, licensees and vocational permits. It also conducts professional certification preparation and formal testing for credentials in Automotive Service Excellence (ASE), the National Board for Certification in Occupational Therapy, the National Council of Examiners for Engineering and Surveying, Board of Certification for the Athletic Trainer, the American Council on Exercise, the Iowa Board of Dental Examiners, Federal Aviation Administration (FAA), and Pearson VUE computer certifications. Other certification programs are offered in electrical technology HVAC, basic life support, and plumbing. Iowa students can get a jumpstart on their careers by completing undergraduate certificate and diploma programs at Southeastern Community College. Diploma programs are offered in automotive technology/repair, accounting, network administration/security, web design, construction/carpentry, industrial maintenance technology, medical coding/billing, certified nursing/medical assisting, fire science and chemical dependency counseling. Continuing education programs build credentials in industrial maintenance, business leadership, and transportation safety. Southeastern’s Enrollment Services Office offers assistance in applying for financial support. More than 80 percent of the school’s students receive financial aid and approximately $250,000 in scholarships is offered each year by the college. Career and technical education (CTE) programs in Iowa are organized within six key service areas which are also aligned with the National Career Clusters™ Framework: agriculture, family and consumer sciences, health occupations, business, industrial technology, and marketing. The Iowa Department of Education mandates that CTE programs include a work-based learning component in the form of job shadowing, rotations, mentoring, internships, service learning, or apprenticeship to ensure students get hands-on training that gives them a competitive edge in the workplace. 32% of the fastest-growing jobs in Iowa demand some form of postsecondary education. Students enrolled in career and technical education have surpassed Iowa’s target performance goals for technical skills attainment for the past five years in a row. Most state-approved trade schools and vocational schools in Iowa are located in major cities, including Des Moines, Davenport, Iowa City, and Davenport. According to 2010 data provided by the Institute of Education Sciences National Center for Education Statistics report, the percentage of Iowa students completing certificate or diploma programs of one year or less is lower than the national average. Meanwhile, the percentage of those completing an associate degree or a bachelor’s degree is slightly higher than the national average. According to 2016 data from the U.S. Bureau of Labor Statistics, the highest number of jobs in Iowa that may require skilled trades education were in fields of: trade, transportation and utilities, education and health services, manufacturing, and professional and business services. Office and administrative jobs accounted for the majority of jobs in Iowa, with more than 146,000 office and administrative support professionals employed in 2014 alone. There are a handful of accredited trade schools located in or around Des Moines that allow students to gain skills and enter the expanding workforce in the metro region. The Des Moines Area Community College offers a range of programs, including vocational training in manufacturing, business, information technology, culinary arts, and STEM, just to name a few. The city also features a collection of beauty and cosmetology schools, such as the Iowa School of Beauty, La’ James International College, and a American College of Hairstyling campus. Des Moines’ UnityPoint Health provides educational training programs for careers in radiologic technology. Those interested in nursing, teaching, or working as a dental hygienist may find programs at the community college in Des Moines as well as trade schools in Davenport and Iowa City. From construction jobs to positions in health care, the city of Des Moines offers a wealth of job opportunities for skilled workers. According to a report from The Greater Des Moines Partnership, some of the biggest employers that may offer trade jobs include: Wells Fargo, Hy-Vee Food Corp., Mercy Medical Center, Principal Financial Group, and Nationwide Insurance. Those seeking jobs in the agricultural filed may find jobs with John Deer Companies and DuPoint Pioneer that have offices in Ankeny, Johnston and Urbandale, Iowa. This organization supports the career and professional objectives of health care professionals, including nurses, nurse aids, and other health service providers. It partners with other organizations to provide valuable career and professional development resources. This associate promotes its mission to support quality career and technical education programs throughout the state. It hosts events and programs centered on leadership, professional development, and partnership. An organization that helps students learn leadership and empowerment skills to take care of their families and communities. Students involved in this organization learn key homemaking skills, life planning and decision making skills to support their family and communities throughout their lifetime. A nonprofit organization that serves all 15 community colleges in Iowa. The organization provides education opportunities for students and hosts webinars and other special events throughout the year. This section of the site provides information on CTE service areas, programs of study, and organizations that support students enrolled in CTE programs throughout the state. Prepares leaders and entrepreneurs as they explore a variety of career paths. The Iowa chapter hosts career development conferences and other special vents for members throughout the year. Those pursuing agricultural careers can join this student organization during high school or when enrolled in a CTE program. The Future Business Leaders of America-Phi Beta Lambda (FBLA-PBL) in Iowa hosts numerous events throughout the year to bring agriculture students and aspiring professionals together while helping them develop strong leadership skills.